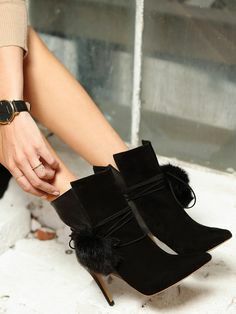 Slippers with pointed toe, velvet bow and fur trimmed sole. Sample colour: black suede, crystals, black velvet. This product is personalized and individually manufactured in our factory. This product is personalized and individually crafted in our factory. Standard delivery: up to 10-12 working days for production. Expres delivery: 5 working days for production. The following colours are generally available for Smiling Shoes models. However, there are special colours that are suitable for certain models. *Small imperfections or slightly colour variations are considered qualities of a natural leather product. *Colour can slightly influence the model’s final image. *The colours are available while stock lasts.